NEW YORK (Aug. 10, 2015) – Atlanta-based Chick-fil-A, Inc. announced today the grand opening date and local franchise owner of its first freestanding restaurant in New York City. The restaurant, located at the corner of West 37th Street and 6th Avenue in the city’s Garment District, is set to open Saturday, Oct. 3. The three-story, 5,000-square-foot restaurant will be Chick-fil-A’s largest in the country and will be independently owned and operated by local resident Oscar Fittipaldi. Fittipaldi has been a Chick-fil-A franchise owner-operator since 2010 when he opened the Chick-fil-A at Aramingo in Philadelphia. He and his family are relocating to the New York area to open Chick-fil-A at 37th and 6th, where he will be involved in all day-to-day operations of the restaurant. Prior to his career with Chick-fil-A, Fittipaldi, a native of Concordia, Argentina, was a sailor in the Argentine Navy, a cruise ship captain and a U.S. Merchant Marine. The restaurant is currently under construction in New York City’s Garment District in Lower Manhattan. The neighborhood, known as a hub for fashion design and manufacturing, has experienced massive growth and revitalization in recent years. In the last six years alone, the District has welcomed 30 new hotels, bringing in 800,000 visitors per year. The neighborhood is also home to the third busiest Metro stop in NYC. Though this will be Chick-fil-A’s first freestanding restaurant in New York City, the company has operated a small licensed unit with limited access and menu items in New York University’s food court since 2004. Chick-fil-A is known for its menu of fresh, hand-crafted food and offers a variety of options for guests. Signature items include a hand-breaded, boneless chicken breast sandwich, Waffle Potato Fries and hand-spun milkshakes. The New York restaurant will use only premium ingredients and make many of its menu items from scratch in the restaurant each day, including hand-rolled biscuits and hand-chopped salads. Chick-fil-A at 37th and 6th will partner with regional farmers and suppliers to source locally grown ingredients for its fresh, handmade menu items. The majority of fresh produce for Chick-fil-A’s hand-chopped salads will be grown on farms in New York and New Jersey. The restaurant’s fresh bread will be delivered daily from Automatic Rolls of New Jersey, based in Edison, New Jersey, and all of the restaurant’s flaxseed flour flatbread, used to make Chick-fil-A’s low-calorie wrap, will be made by Brooklyn-based Damascus Bakery. Chick-fil-A’s sustainability efforts will focus on serving better food in greener restaurants with reduced waste. 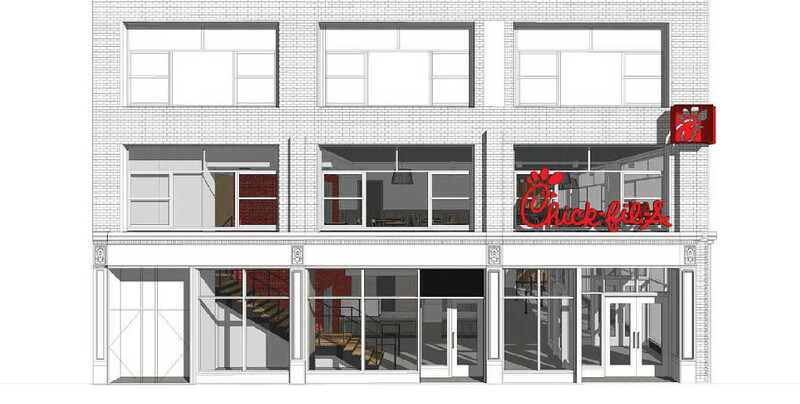 Chick-fil-A at 37th and 6th will be one of the few quick-service restaurants in New York City built to LEED® specifications with water and energy efficiency features, air quality control and waste diversion efforts, among other initiatives. The restaurant will be among the first Chick-fil-A restaurants to feature an “InSinkErator” food waste disposal system, which spins and separates liquid from solids. The technology will reduce the volume of the restaurant’s organic waste by 80 percent. The restaurant will also recycle all cardboard and plastic used in back-of-house operations, and provide napkins, tray liners and Kid’s Meal bags made from 100 percent recycled materials. All beverages will be served in compostable paper cups. Beyond its sustainability features, the restaurant was specifically designed for the busy lifestyle of New York customers, with increased ordering, production and assembly capabilities in order to meet high demand. To expedite the ordering process, restaurant employees will use iPads to take customer orders, so meals will be ready once guests reach the counter. Chick-fil-A at 37th and 6th will create approximately 180 new full-and part-time jobs, with team member hiring slated to begin in late August. Chick-fil-A is known for hiring, developing and retaining young talent, offering a supportive workplace with opportunities for leadership development, promotions that lead to management roles, the opportunity to earn college scholarships, respect for work-life balance (with Sundays off) and competitive wages. Over the years, the restaurant company, which employs more than 75,000 individuals through both corporate positions and franchised locations, has provided more than $30 million to help its team members pay for college. Among other locally-based giving initiatives, Fittipaldi will partner with New York Common Pantry, a local organization committed to reducing hunger in New York, to make donations of food multiple times a week. With a longstanding tradition in the restaurant industry for setting the highest standards in customer service, Chick-fil-A recently ranked first for customer satisfaction in the Limited Service Restaurants Industry by the American Customer Satisfaction Index for 2015. The company has also earned recognition as one of America’s “Most Inspiring Companies” by Forbes Magazine, one of America’s “Top 20 Most Admired Brands” by The Harris Poll and “Top Fast Food Chicken Chain” by Consumer Reports, among other honors. Chick-fil-A launched a new website, NYCCFA.com, to serve as a hub for information about Chick-fil-A at 37th and 6th, as well stories about team members, the surrounding neighborhood and more. Guests are encouraged to visit NYCCFA.com or the restaurant’s Facebook page – facebook.com/cfa37thand6th – for the latest information leading up to grand opening. The restaurant is scheduled to be open from 6 a.m. to 10 p.m. Monday through Saturday beginning Saturday, Oct. 3. Atlanta-based Chick-fil-A, Inc. is a family owned and privately held restaurant company devoted to serving the local communities in which franchised restaurants operate. Known for its original chicken sandwich, Chick-fil-A restaurants serve freshly prepared food in more than 1,900 restaurants in 41 states and Washington, D.C. Founded in the early 1960s by S. Truett Cathy, the Chick-fil-A system produced sales of nearly $6 billion in 2014, which marks 47 consecutive years of sales growth. Chick-fil-A ranked first for customer satisfaction in the Limited Service Restaurants industry according to the 2015 American Customer Satisfaction Index and received the highest ACSI score ever in the industry. The company was recognized in 2014 as one of America’s “Top 20 Most Admired Brands” by The Harris Poll, “Top Fast Food Chicken Chain” by Consumer Reports and the only restaurant named to 24/7 Wall Street’s “Customer Service Hall of Fame.” More information on Chick-fil-A is available on the chain’s website located at www.chick-fil-a.com.